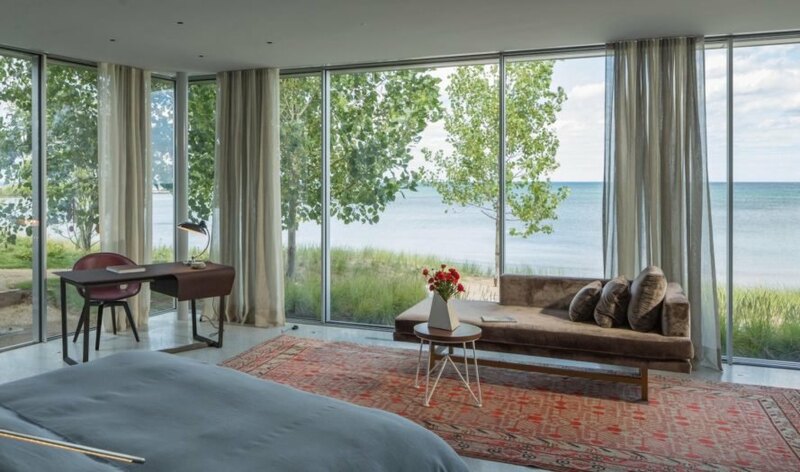 New York-based architecture firm Gluck+ designed a green-roofed home that brings breezy West Coast vibes to a midwestern lakeside in Chicago. Built to house a family of seven, the large luxury home is a beautiful modern and minimal triumph that complements the neighboring Baha’i Temple, a stunning domed house of worship made of white stone and adorned with intricate lace-style detail. Like many of the firm’s projects, the House to the Beach is buried into the earth and is integrated with a number of renewable systems to substantially lower its energy footprint. Despite the picturesque views, the lakeside plot posed a challenge, not only because of a 40-foot elevation difference between the road and lake, but also because of the Baha’i Temple next door. Rising 135 feet in the air, this monumental Chicago landmark is a show-stealer—the gorgeous spherical building is a curious oddity in the suburbs and the only surviving temple of its kind in the U.S. Rather than compete with the temple, the House to the Beach serves as a foil to the ornamental monument with its minimalist and subdued facade. The white four-story home gradually steps down from the street to the lakeshore and is partially buried in the earth. The topmost two-story structure closest to the street contains the garage, a gym, and a guest suite and is shielded from the street with a windowless facade. In contrast, the lake-facing elevation features large windows that let in natural light and frame picturesque views. Accessible green roofs, which double as suburbia-inspired lawns, spread out on the roof terraces. The house requires less energy than a similar building of its type and size thanks to the copious amounts of natural light; efficient insulation from the surrounding earth and green roofs; geothermal heat pumps; and a network of rooftop solar hot water panels. Despite the picturesque views, the lakeside plot posed a challenge, not only because of a 40-foot elevation difference between the road and lake, but also because of the Baha’i Temple next door. Rather than compete with the temple, the House to the Beach serves as a foil to the ornamental monument with its minimalist and subdued facade. The white four-story home gradually steps down from the street to the lakeshore and is partially buried in the earth. The topmost two-story structure closest to the street contains the garage, a gym, and a guest suite and is shielded from the street with a windowless facade. In contrast, the lake-facing elevation features large windows that let in natural light and frame picturesque views. Accessible green roofs, which double as suburbia-inspired lawns, spread out on the roof terraces. The house requires less energy than a similar building of its type and size thanks to the copious amounts of natural light; efficient insulation from the surrounding earth and green roofs; geothermal heat pumps for heating and cooling; and a network of rooftop solar hot water panels.